Enhance spot and stain remover cleans and freshens carpets. Enhance spot and stain has been formulated to provide an all in one carpet spotting solution for all common water and oil based spots and stains. It is Woolsafe approved and is safe for use on all carpets and soft furnishings. Enhance spot and stain contains odour neutralsing technology. This technology works to destroy the malodours in carpets and furnishings leaving a fresh apple fragrance. 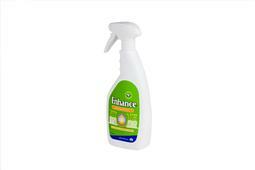 Enhance spot and stain comes ready to use in an easy trigger spray. Simply apply the product directly onto the stain and leave for 30 seconds before blotting, then rinse with clean water.